With the new PCA2 protection condition analyser from Megger, it is now possible to test simultaneously all of the key elements of substation protection systems - including protection relay, circuit breaker, DC system, and protection circuitry - even while the system is on-load. The unit captures detailed information about the full protection operation sequence, before, during and after the trip, making it an ideal choice for critical first-trip testing. Developed in conjunction with EDF Energy UK, the PCA2 is a complete substation protection performance evaluation and recording system. 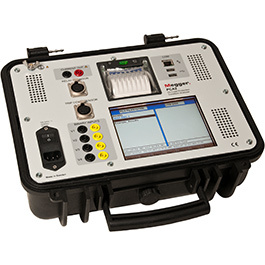 It features a unique software-controlled current source that can inject a precisely controlled test current into the protection relay, even while the system is on load. During the test, the instrument continuously records the trip-coil voltage and current profile, together with additional user-selected voltages, currents, and contact timing values using its integrated high-speed oscillographic recorder. A large capacity internal memory stores the captured data for instant replay on the instrument's bright high-resolution touch screen, and for print-out on the integrated tally-roll printer. The data can also be written to a USB memory stick, in standard COMTRADE format, for easy and convenient transfer to a PC. The PCA2 is equally suitable for on-load and off-load testing. When used in on-load mode, an auxiliary clip-on hall-effect CT monitors the load current for main contact timing. It is also used as a feedback element so that the current injected by the instrument into the relay under test automatically takes into account the load current already present. The current source in the new Megger PCA2 protection condition analyser uses digital waveform generation and low-noise switching amplifier technology, allowing it to generate waveforms with precisely controlled amplitude, frequency and phase angle. The output is continuously monitored, ensuring that the instrument provides an accurate, ultra-low distortion waveform, irrespective of the operating conditions. Clean sinusoidal waveforms are delivered, even when working with difficult loads, including electromagnetic relays. To further enhance the versatility of the PCA2, it is possible to use the current injection and oscillographic recording functions completely independently. With the standard configuration of the instrument, the oscillograph function has two current and four voltage/contact channels. The voltage/contact channels can alternatively be used with motion transducers or, in conjunction with optional clip-on current probes, for recording additional currents. The new PCA2 features compact yet robust construction and is supplied complete with a padded protective case, power and test cables, two clip-on hall-effect probes and a 1 GB USB memory stick. Also included is a calibration certificate, which means that the instrument is ready for immediate use straight out of the box, a detailed operating manual and PC-compatible PCA viewer software.